My latest food column for the Eugene Weekly is on the stands! If you’re looking for recipes I mentioned in the article and similar ones, here are two for frozen corn. My summer blueberry liqueur and blackberry thyme vinegar recipes are now available for the clicking. Fava bean recipes I wrote last year are here. And an impromptu frozen chicken drum-ette fiesta with frozen tomato puree takes place under these words. I thought I’d provide another good frozen berry recipe today: something to whittle down those berry bags. Varenye is a loose Russian preserve served as a sweet treat. In Russia, they eat it in a little bowl alongside tea, or actually in the tea itself as a sweetener. I eat it on bread, but it would also make a good topping for crepes or waffles, since the berries are swimming in syrup. Best yet: it’s a concoction anyone can make at any time. 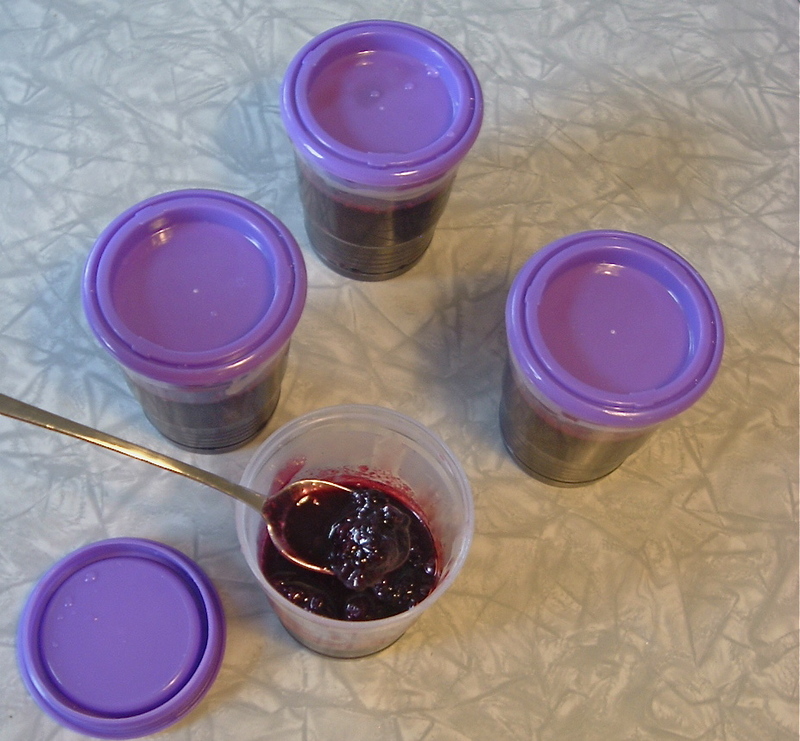 You can use frozen berries and you don’t have to worry about sterilizing jars, since the preserve is stored in the freezer. No pectin to buy, either. It’s easy and delicious — what else can we ask for in late winter? My varenye is made with frozen boysenberries and my homemade blackberry cordial, a vodka-based fruit liqueur, but you can use any kind of blackberries. Any berry, really. This version has less sugar than some recipes, which can run up to a 1:1 ratio of sugar to berries. The instructions to bring the berries to a boil three times, cooling in between, seem unnecessary, but that’s how I first heard the recipe I rather like the tradition. Bring all ingredients up to a boil, stirring carefully to ensure the sugar has melted. Reduce heat and simmer for 5 minutes, removing foam if necessary. Let cool, then bring to a boil again and simmer for 5 minutes. Repeat a third time. Pour varenye into freezer-safe containers and keep in the freezer, spooning out a bit into a bowl, spooning out a bit when you need it. The sugar will keep the varenye from completely freezing. You can also keep a small jar in the refrigerator, but the preserve lacks the copious amounts of sugar in regular jam and won’t keep as long, so plan on using refrigerated varenye within a couple of weeks. *I freeze my berries with a ratio of 1 c. sugar to 3 lbs. berries to keep them plump and individual in the freezer, as per MFP guidelines. I think it’s also common in Russia to sweeten with preserved cherries. I wonder if the fruit/sugar ratio is the same. My grandmother would make strawberry varenye, and use the 1:1 ratio, and I think one more cup of sugar “for the pot,” though this is probably not necessary. Then she’d put it in old jars she had lying around, that were NOT sterilized, and leave them on the shelf for months – and eat them! I certainly do not advocate following these shody food safety practices, but my point is, there is so much sugar in varenye, it really keeps the bacteria at bay. As to her method of preparation, she’d put the berries in the pot, pour the sugar on top, and then set it on the lowest flame possible on the stovetop, shaking the pot every so often. It is forbidden to stir it! Then let it simmer for a while on the lowest flame possible, skimming off the pink foam that floats to the top. When most of the foam is removed, the varenye is basically done. This is from an old Russian! Russians like to eat this stuff straight – in very small amounts, of course – out of a little bowl (maybe a 1/2 cup measure bowl) with a spoon, along with their ubiquitous tea. Some people actually put it in their tea, creating a fruit tea. This tradition probably came about in the days when the poor serfs had no access to sugar.